Another illustration from one of several pages for Book of Pages that never made it into the final story (drawn sometime around 1991). 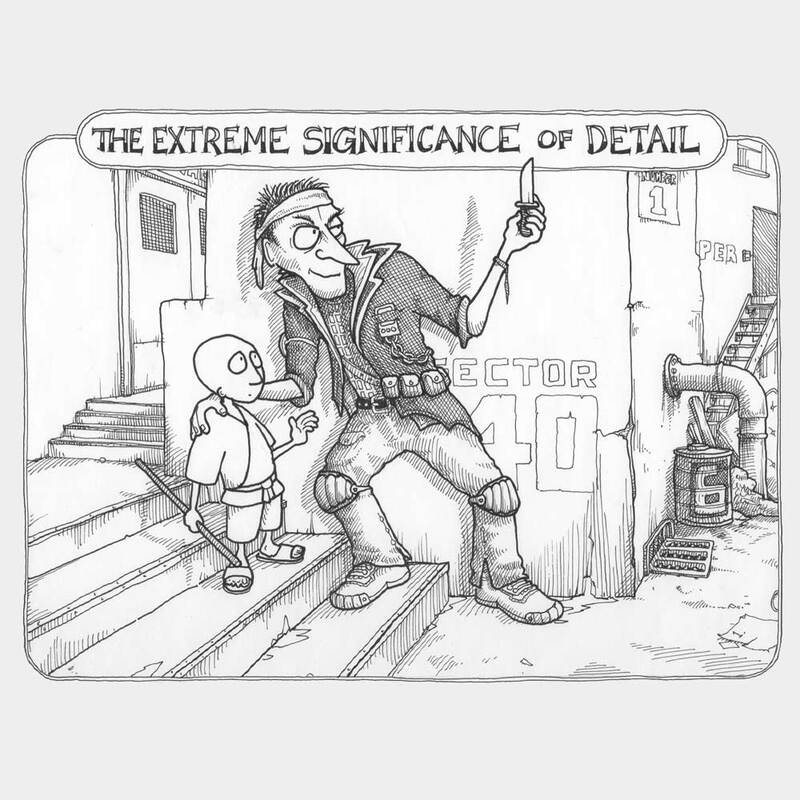 This one is “The Extreme Significance of Detail”. Contrary to appearance, the Metrolpolis-dweller here isn’t trying to mug Jiriki, but instead wants to tell him about the overlooked qualities in the traditional manufacturing process that created his knife. The numbers in the drawing, like all the numbers in Book of Pages, were page references to related (by topic) pages. This became, uh, problematic as pages got dropped, added and re-ordered during the book’s development. These days I could fix it all up in Photoshop, but this was done with Tipp-Ex, a scalpel, or — most often — redrawing. Although in the end this particular illustration wasn’t used, Jiriki strikes a very similar pose in “Mind Dragons” (p.39 of the final book). Clearly I am not adverse to tracing my own work when needs must.